In a confederate system as diverse as Switzerland, it is hardly surprising to find that Cantons and cities occasionally engage in very local celebrations that no one else has ever heard of. 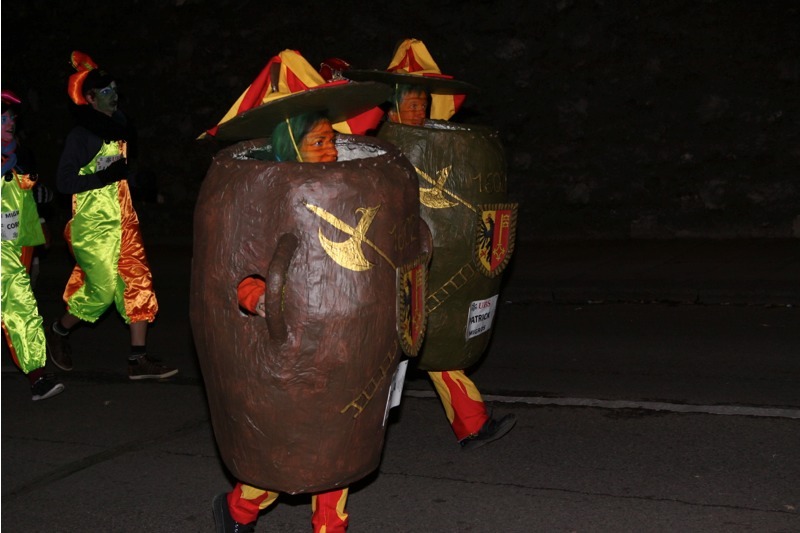 There is the Chalandamarz and the Pschuuri in the Grisons, or the Bloch at Mardi Gras in Appenzell. 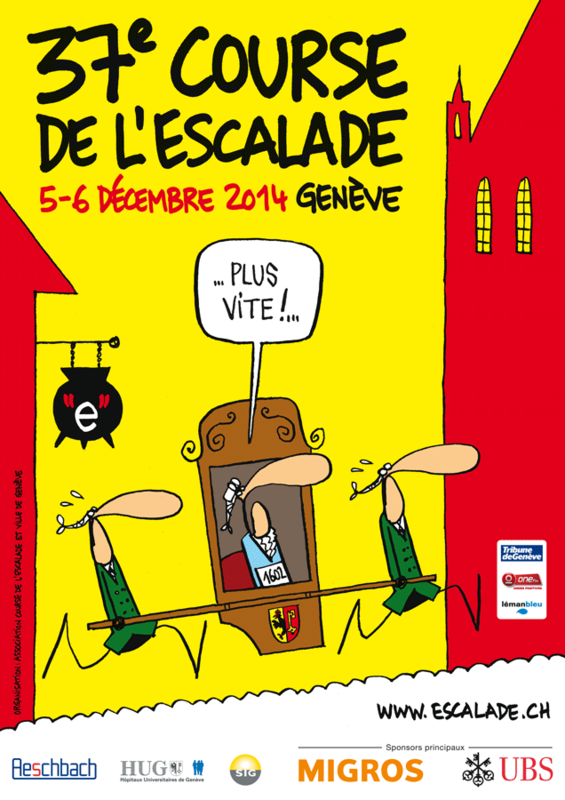 Not to be outdone (especially by its Germanic co-confederates) , Geneva has the “Escalade,” The Climb, which has evolved into one of the main participatory spectacles in town. Geneva is Geneva, of course, and stringent logic often seems absent from the organisation of local urban life, so the climb actually involves horizontal rather than upward mobility. Much of the event consists of people running, Marathon-like, through the city on the first Saturday in December or, if Saturday falls on the 11th, then on the second Saturday. In 2014, it was on Saturday December 6. The date, like the hare-brained configuration of the city’s public transportation, needs some clarification. The event that spawned The Climb took place on a wintry night of 11-12 December 1602, the longest night of the year, since Genevans still used the old Julian calendar at the time. Duke Charles-Emmanuel I of Savoy had coveted the Calvinist city north of the Alps, and was hoping to force it back into the Catholic fold for religious, strategic and economic reasons. On that fateful night, a band of mercenaries managed to scale (escalader) the walls at around 2 a.m. When two sentinels ran into them, all hell broke loose. Reports say that civilians joined in, throwing heavy stuff out of windows, tables, chairs, barrels, stones, and real weapons like halberds. The Genevans got the better of the attackers. They lost 18 men in the skirmish, 54 of the attackers were killed, 13 taken prisoner, tortured and executed. Ultimately Charles-Emmanuel signed a treaty with the city and peace was restored once and for all at the Treaty of St. Julien (a town just beyond the border in France). A year later, the whole battle and its political setting were set to music to an epic ballad in 68 strophes in Provencal dialect, Cé qu’è lainô. The event was also immortalized in a poem, Genève delivrée, by Samuel Chappuzeau. 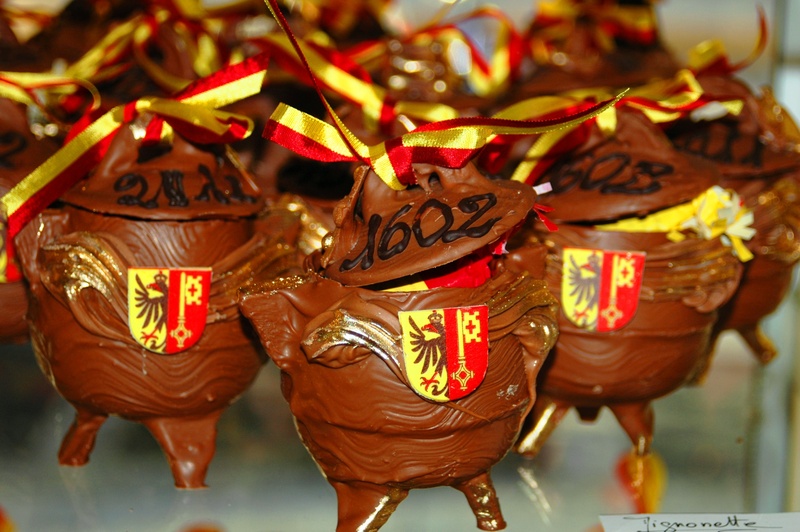 In 1926, an association called Compagnie de 1602 started a parade to celebrate the victory. Participants come in gaudy period costumes; there are drummers, fife-players, weapons-bearers, a hangman and other period figures. Today, the parade, which is held on Sunday after the races, ends at the door of the Cathedral St. Pierre in the old town with speeches exalting the Republic, freedom, and so on. The Escalade races were started in 1978. They now last almost all day, with participants broken down into different categories running set courses in a staggered schedule. Ages range from the “Poussins” and “Poussines” (literally chicks, boys and girls born in 2005-6) to Hommes VI or Femmes VI, men and women born before 1942. The length of the run goes from 1.8 km for the youngest runners, to 7.2 km for the older ones. This year drew 32,150 participants. All races begin and end in the Parc des Bastions right under the walls of the old town. Walking and Nordic Walking have also been introduced for more comfortable sportspeople 10 years of age and above. The 8-km course begins in Veyrier and ends in the Parc des Bastion. The final race is the Course du Duc (the Duke’s Course) and is the toughest, naturally, since the Duke lost the battle: 17.5 km. There are fees for the runners, and those running the longer itineraries will have to get medical certificates. For more details, please visit www.escalade.ch. The money paid goes to maintaining the costumes and organizing the events. The final race on Saturday is simply called “Marmite”, or Cauldron and comes in two categories, youth and adult. The runners complete their nearly 3.5-km itinerary in crazy garb. There are no real winners here, but whoever comes first in this fantastical dash, will have their name and pictures published in the local paper, the Tribune de Genève (along with the serious runners). The chaudron is ubiquitous in Escalade season. Throughout the festivities, spectators and participants are regaled with vegetable soup cooked in great cauldrons sometimes on an open fire. It’s a very pleasant and fortifying dish in the damp and frigid days of early December. Escalade parties are held during this time to which children come disguised and singing a ditty that gives a blow-by-blow account of the “battle”. They will occasionally do something resembling trick-or-treating, i.e., knock on people’s door, sing that very same ditty, an request candy or coin. On one evening, children, parents and staff are invited to contribute vegetables to a big cauldron of soup, which is enjoyed usually with bread and some sweets. Those raised on Asterix may get the wrong idea. The brave and independent Genevans did not beat back the Savoyards intruders by dint of a magic vegetable soup. Somewhere on the line a story emerged from the mists of history, that one Mère Royaume, living near the city gates was in her kitchen cooking a cauldron of vegetable and rice soup. Hearing the enemy in the streets, she carried the heavy pot to the window and heaved it onto the hapless invaders. Mère Royaume was a real person. She was Catherine Cheynel, born in Lyon. She and her second husband, a maker of tin pots, were Protestants and escaped to Geneva soon after the massacre of St. Bartholomew (August 1572). By 1602, she was 60 years of age and had given birth to 14 children, few of whom had survived. The idea of her dumping hot soup on an enemy apparently comes from Verse 29 of the epic Cé qu’è lainô mentioned above. But history has many such modest heroes, like the women of Eger in Hungary who threw boiling fat on the attacking Turks. As a journalist, I must wonder: What was she doing cooking vegetables soup at 2 a.m.? And would she, as a Protestant Genevan, waste food that way? Really? It is difficult to imagine. I suspect that on waking and hearing the ruckus, she grabbed the first thing at hand … under, or close to, her bed and hurled that out the window. So whosoever came up with the marmite idea has done us all a great service in Geneva. Imagine thousands of Genevans screaming: “Ainsi périssent les ennemies de la République!” while standing around steaming chamber pots. Whatever the history, Geneva loves its Escalade, and for good reason. It’s a heart-warming, belly-filling feast, with so many parties, no one has to have a bad conscience for having fun. People from all walks of life have a chance to rub elbows in a congenial atmosphere. In some ways, too, it celebrates the victory over Catholicism in what was then a strictly Protestant-Calvinistic city. Paradoxically, it now serves to conveniently condense and celebrate Carnival, St. Nicholas and other religious/profane festivities that Calvin and his dour and sour successors had wiped off the calendar.